How To Buy China Train Tickets Online With Trip.com? You can buy China train tickets online with Trip.com up to 60 days in advance and at least 35 minutes before the train’s departure. If you want to have your China train tickets delivered to your chosen address, you’ll need to purchase train tickets at least three days prior to departure. Simply select “Trains” on the navigation bar of Trip.com’s home page, enter your desired route and date, and click “Find trains.” Select the train that best suits your needs from the results and complete the instructions to make your reservation. In accordance with the real-name requirements of China’s railway authority, you must provide your full name as it appears on your valid ID (for most foreign nationals, this is your passport) as well as the ID number. Once you’ve completed payment, China train tickets can be picked up at any train station in Mainland China or can be delivered to your chosen address. The delivery fees are CNY 40 for the first train ticket and CNY 20 for each additional train ticket. China train tickets are delivered within 24 hours of being issued. For train ticket pickup, go to any railway station or authorized ticket office in Mainland China with your ticket pickup number along with the ID you used for booking. Note that only one-way train tickets can be purchased and that the number of train tickets is limited to a maximum of five per booking. Once issued, Trip.com cannot cancel or modify your China train tickets. If you need to cancel or modify your ticket, go to the refund window at the railway station with your tickets and ID. China train tickets can be purchased 58 days in advance at train stations and local ticket agencies in China. Again, you’ll need a valid ID such as your passport to buy a China train ticket. 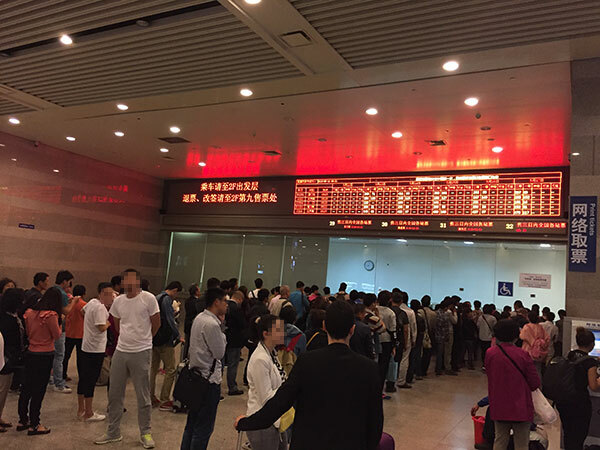 The ticket windows at Chinese train stations are open 24 hours a day. Local ticket agencies – kiosks found throughout Chinese cities, such as near your hotel – operate on regular business hours, generally from 9 a.m. to 5 p.m.
Because the staff at the railway station or train ticket office might not speak English, it can be helpful to have the details for your trip – such as the train number, travel date and destinations – written in Chinese. Railway stations in major cities, such as Beijing or Shanghai, often include windows for foreigners or English-speaking agents. The self-service machines that you see next to train station ticket windows can only be used with Mainland China ID cards. When you tell the agent where you want to go and at what time, you will be shown available trains and departure times on the screen. Choose the best ticket for your trip, hand over your valid ID and payment, and the tickets will be printed for you. An additional fee, usually CNY 5, is charged for tickets issued at local ticket agencies.